Ignatius Loyola, founder of the Jesuits. Ignatius Loyola created a vision on the way to approach spirituality, a “way of proceeding.” These innovative ideas are showcased here in Ignatius life and his classic text, Spiritual Exercises, that today drive Jesuits, laymen and Pope Francis. Old St. Joseph’s Church guides us in our spiritual understanding of Ignatius of Loyola. David Fleming, in his book What is Ignatian Spirituality, begins by noting in the Preface that in founding the Society of Jesus, St. Ignatius was “more interested in a whole-person approach than in rules”. 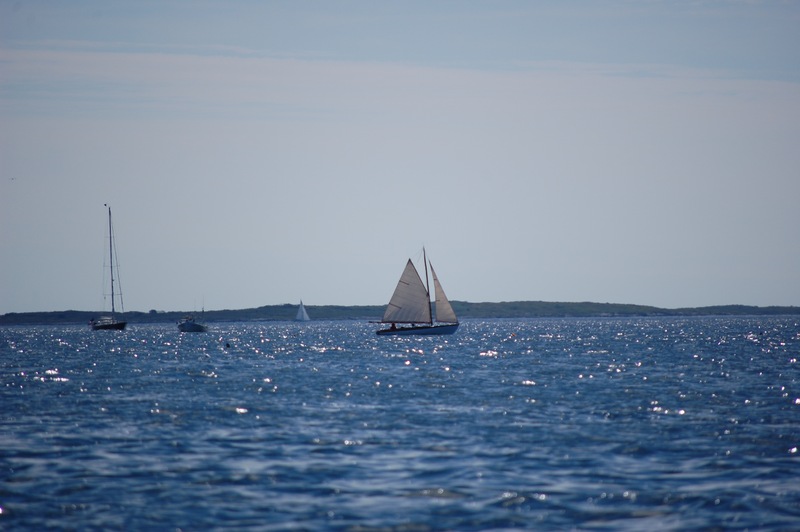 As a result, Ignatian spirituality may be understood as “a spiritual ‘way of proceeding’ that offers a vision of life, an understanding of God, a reflective approach to living, a contemplative form of praying, a reverential attitude to our world, and an expectation of finding God daily”. In other words, Ignatian spirituality entails a worldview and a way of life. – From Fr. Dan Ruff S.J. former pastor at Old St. Joseph’s Roman Catholic Church, Philadelphia Pennsylvania. Ignatius compares the gifts of God as light from sun and water from a spring source. We share with God everything we have. 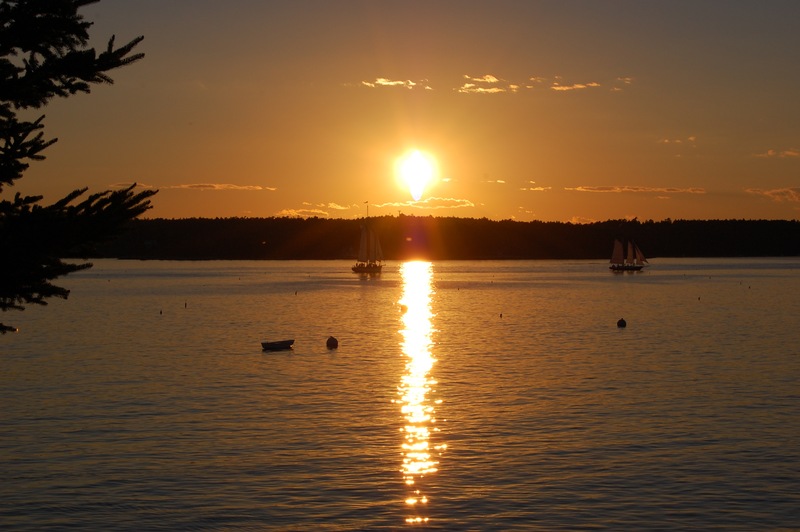 “God’s love shines down upon me like the light rays from the sun” says Ignatius. Ignatius comments that life is about God in our daily lives…all the gifts to us to know God more easily and return love more readily. As good stewards and loving persons we care for God’s world. – David Flemming S.J. author of What is Ignatian Spirituality? God is the light of the world. Photo by Oer-Wont. 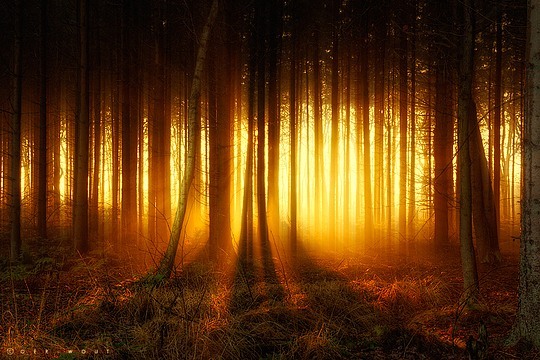 Light is beautiful and mysterious, just like God. God as a giver of gifts speaks to us through his giving. This is a central theme of Ignatian Spirituality, love shows itself in deeds over words. We are asked to share and give what one has. 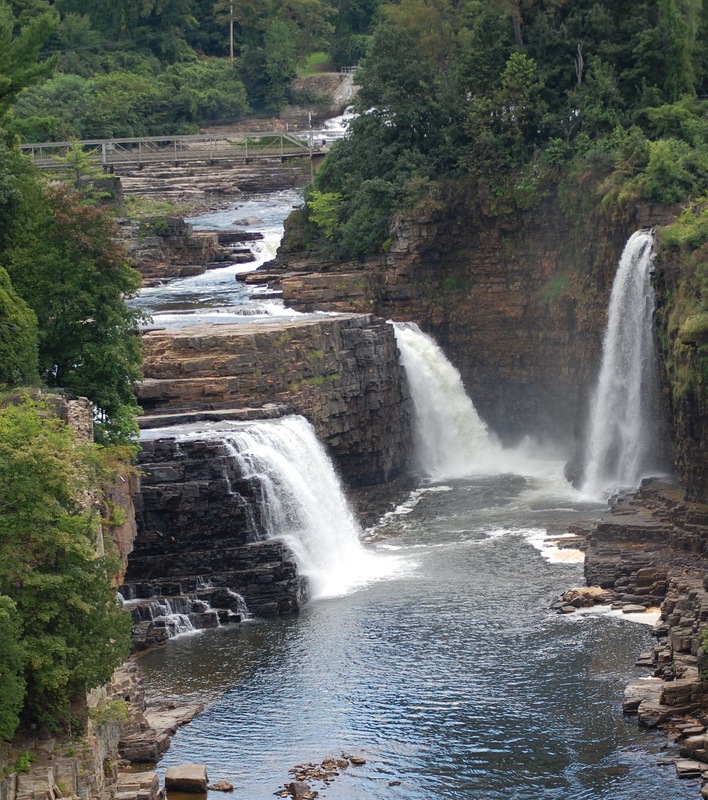 Three Waterfalls. Ignatius vision directs us to the source of life. Our one desire: to want and choose what better leads to God’s deepening life in me. – David Fleming S.J. The real source of life is the Eucharist. Christ is in the trenches doing the evangelizing. We are asked or called to work with him. David Fleming S.J. author of What is Ignatian Spirituality says it’s the Call of the King . . . we should think of Jesus as a king, we owe reverence and obedience. This expands to reverence for all the gifts of God’s creation that are given to us. 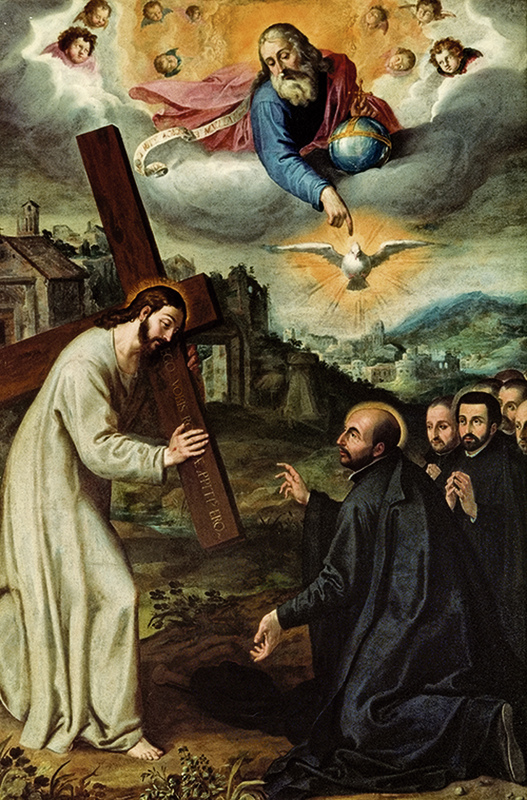 Ignatius recovers from his wounds at Loyola by Carlos Saenz de Tejada. 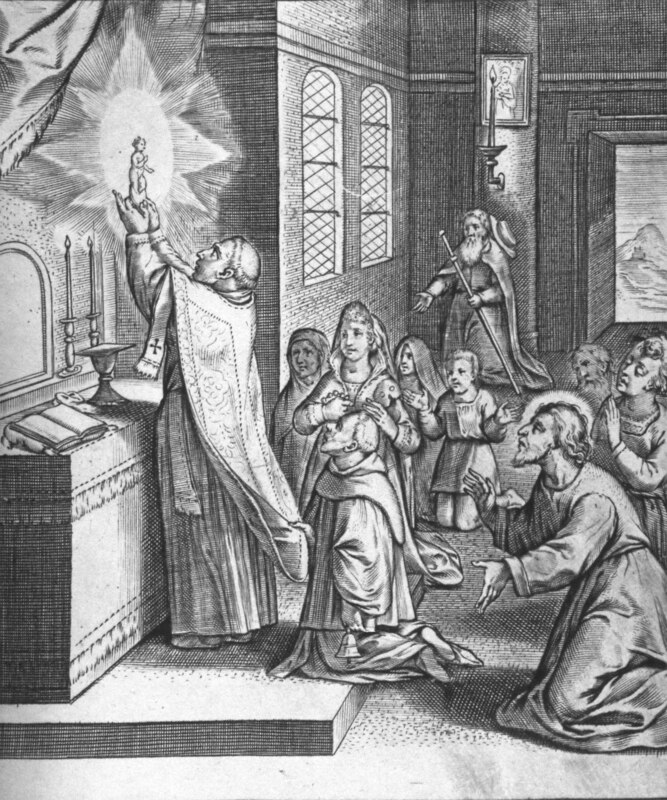 Ignatius says God’s gift is himself in Jesus in the Eucharist. God created Jesus. By receiving God, we become his hands, feet and voice in our world. 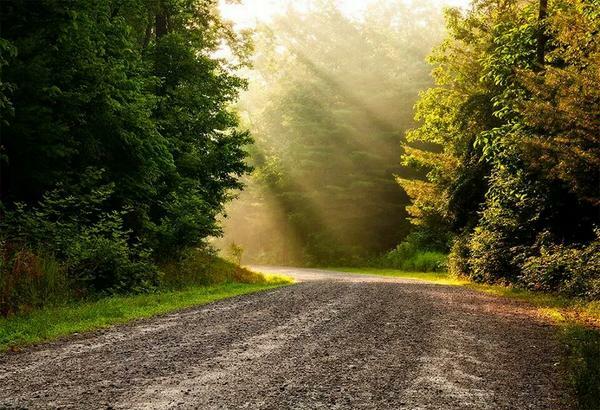 All the things in this world, says Ignatius, are ways to become closer to God. Old St. Joseph’s Church and National Shrine in Philadelphia, Pennsylvania. 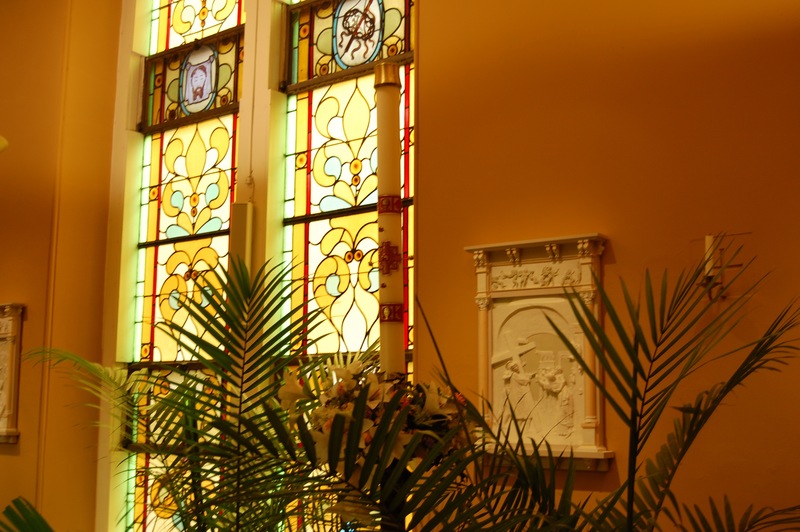 Founded by the Jesuits in 1733, Old St. Joseph’s is the oldest catholic community in Philadelphia. It is a national shrine from a historical standpoint. The current church is the third church on the site, built in 1839. St. Joseph’s University and St. Joseph’s Preparatory School were founded at Old St. Joseph’s. 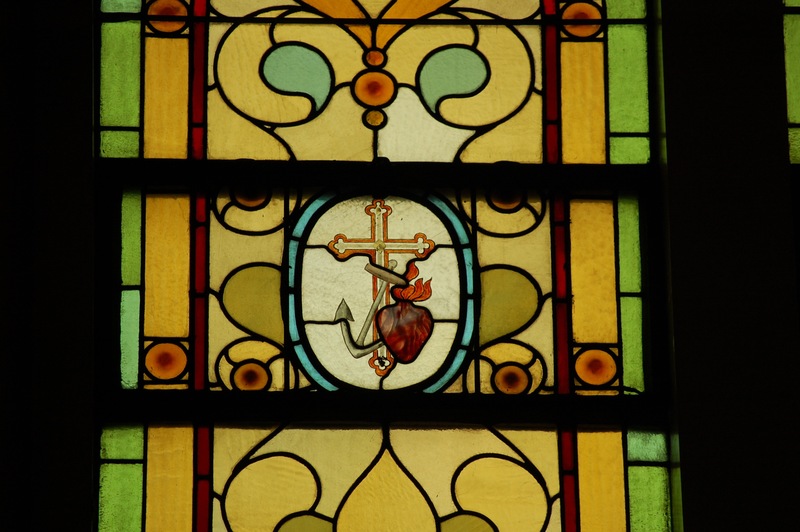 The Heart mosaic stained glass window at Old St. Joseph’s Church in Philadelphia, Pennsylvania. The Mosaic windows were for church’s that couldn’t afford figured stained glass windows, which at several points over the centuries, Old St. Joe’s was in this category, a poor parish. The heart referenced by Ignatius is the inner orientation of a person. Ignatius stressed the vision of God is from our hearts not our minds. Organ at Old St. Joseph’s Church, Philadelphia PA. Ignatius had a vision of organs playing. While praying outside a monastery, Ignatius had a mystical vision, hearing three organs playing at the same time. This was a response from God on the question of whether four prayers should be said: to the Father, Son, Holy Spirit and the One God, or three prayers: to the Father, Son and Holy Spirit. The three organ response was the answer from God to Ignatius. 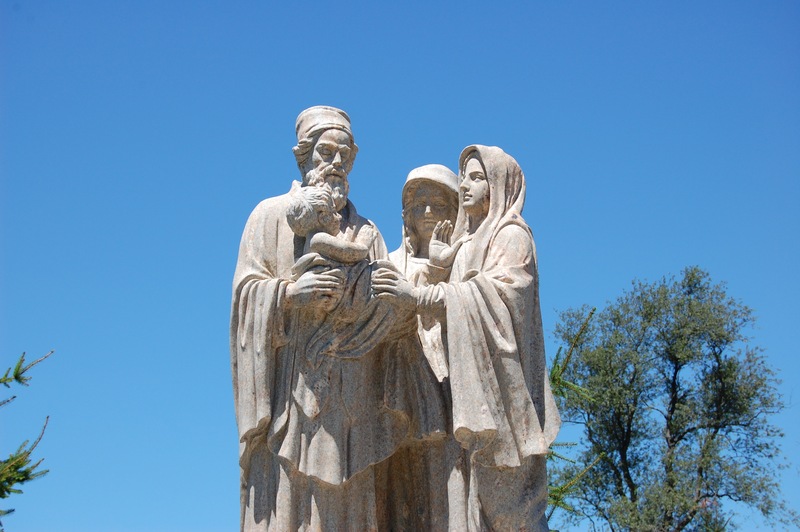 Ignatius wrote the Spiritual Exercises, his landmark spiritual guide, in a Manresa cave after experiencing a vision of the Virgin Mary and the infant Jesus at the shrine of Our Lady of Montserrat in March 1522. This was well before Ignatius took up religious vows. The Call of the King is a section of the Spiritual Exercises in which the goal is a response from the heart. Ignatius says, listen to the language of the heart. This is a cornerstone to the Spiritual Exercises. Bench Inviting Reflection. Photo by Oer Wout. 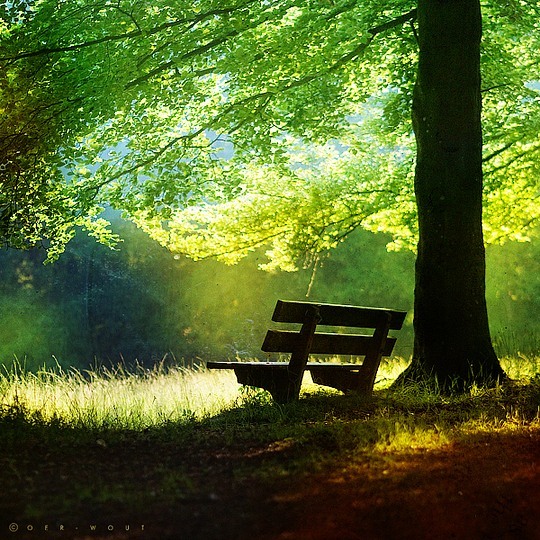 The Examen is a method for detecting God’s presence during the day. 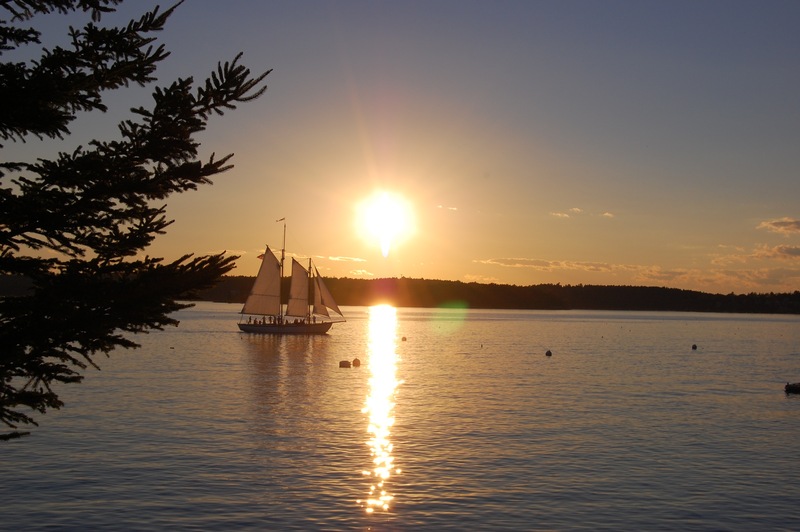 The Jesuits believe reflective prayer at mid-day and before retiring to sleep is a core to the Spiritual Exercises. 3. review the day and determine where God is present and where God is left out. Author’s personal note – I practiced the examen technique after reading the Fleming book. It really is an effective mechanism to review the day and where God played a role. Many things quietly surface that go unnoticed without using the examen. David Fleming S.J. says if we get any one thing out of the Spiritual Exercises it should be the examen. Washing Christ’s feet at the home of the Pharisee. By Artus Wolffort d 1641. Sin is a failure of gratitude. Sin is also a lack of reverence for God. We sin because we don’t fully grasp what God has done for us. Even though we reject God, he still blesses us. 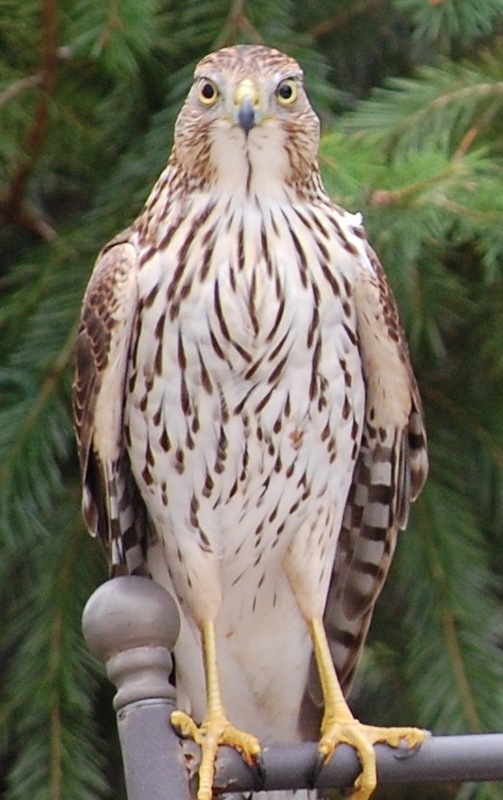 We enjoy the bounty of God’s creation, heavens, moon, sun, stars, fruits, birds, fishes and animals. – David Fleming S.J. Ignatius says, “If people but knew you, they would never offend you”. As we mature as followers of Christ, we grow in our sensitivity to sin, yet even sinners can respond to God’s invitation to join him. – David Fleming S.J. Pilgrims are people on “a way”. Photo by Oer Wout. 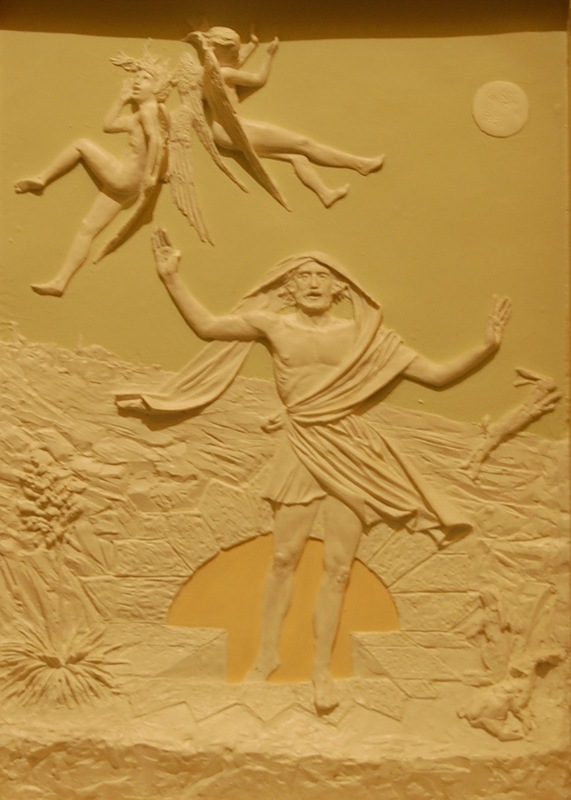 Risen Christ by Tony Visco. Station of the Cross at Old St. Joseph’s Church, Philadelphia PA.
Ignatius pictures the risen Christ calling every person to follow him. God takes the initiative. We respond. 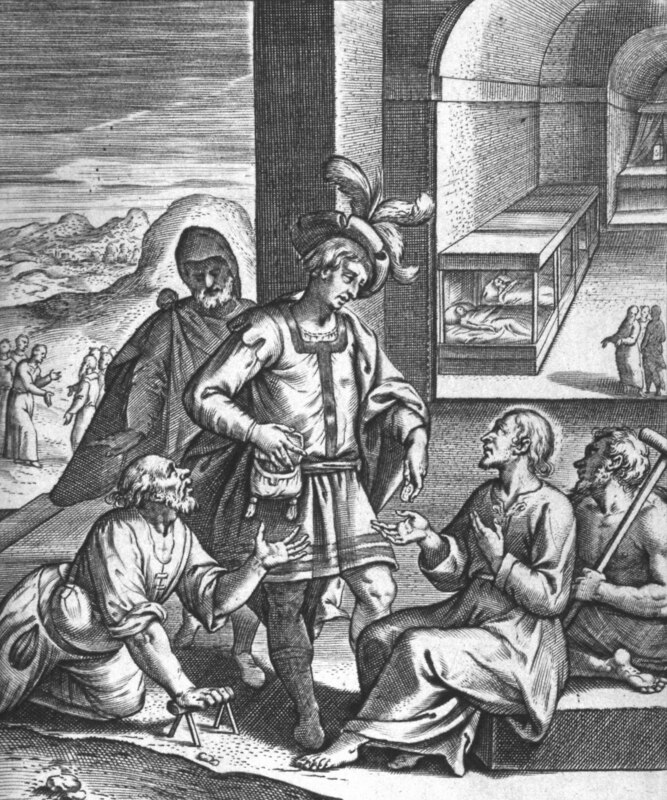 Ignatius used the call of Matthew the tax collector as an example of Jesus inviting people to follow him. Jesus said, “Follow me” and Matthew then got up and followed him. Active passivity captures the characteristic tone of Ignatian Spirituality. The question we seek is “What more does God want of me”? – David Fleming S.J. Magis loosely means “the greater thing” or “the better thing”. Magis comes from within the Latin phrase Ad majorem Dei gloriam (AMDG) translated means “For the greater glory of God”. St. Ignatius asked himself and those around him, “What have I done for God? What am I doing for God? and, “What more can I do for Him?” – Fr. Dan Ruff S.J. “More” is the magis of Ignatian Spirituality. Our God is a “media God”. Ignatius liked the theater and was media savy for his day, having put in the first printing press. God is media savy as well. 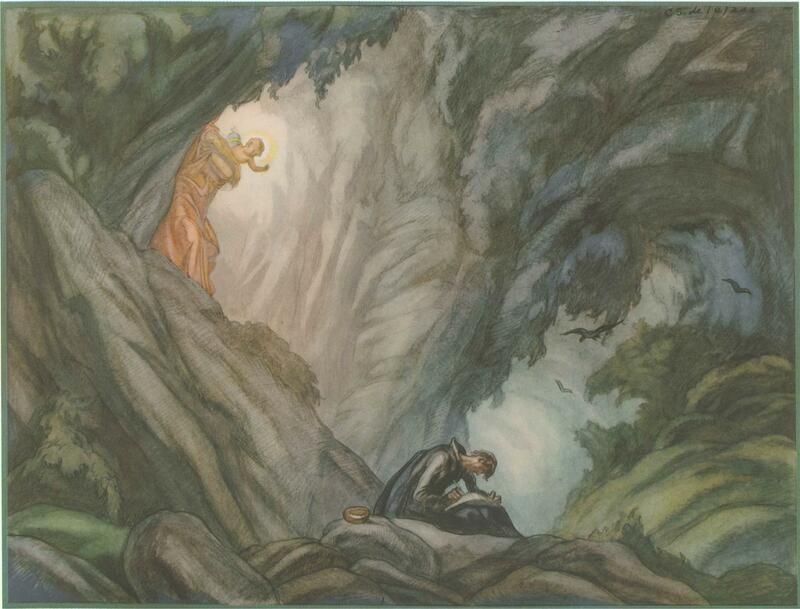 God’s voice is usually quiet, like Elijah said, “a tiny whispering sound”. 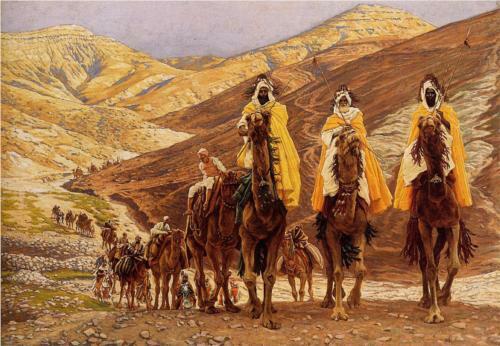 Journey of the Magis by James Tissot 1894. God talked to the Magis and they followed. 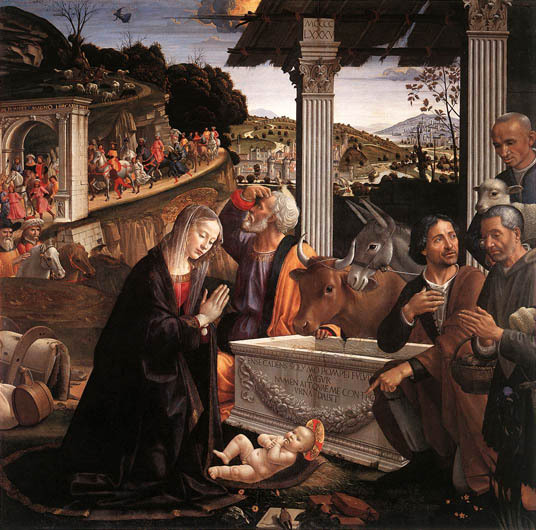 The Incarnation is the “media event” for Ignatius where God became human in Jesus Christ, according to David Fleming S.J. Ignatius used this to show that God is present in his creation and uses all aspects of creation to speak to us. By “finding” God, means engaging God, meeting him and conversing with him. According to Ignatius, prayer is a conversation with God, like talking to a good friend. He included conversations with other friends in ministries. To converse is one of the ways of loving. Prayer takes many forms; mystical, devotional, liturgical and sacred reading. All are included in Ignatius “conversar” meaning to “talk with” or ” to converse” according to David Fleming S.J. 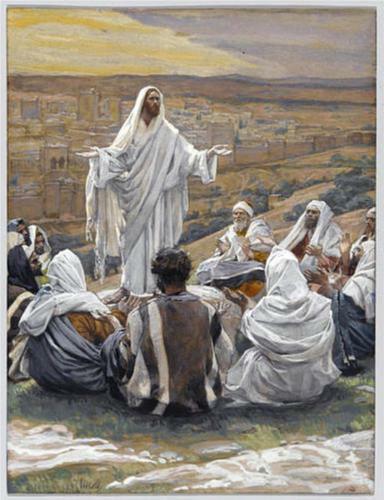 The Lord’s Prayer by James Tissot 1896. “Lord teach us to pray”. Ignatius developed the Spiritual Exercises including prayer as a conversation after years of study before he was ordained to priesthood. 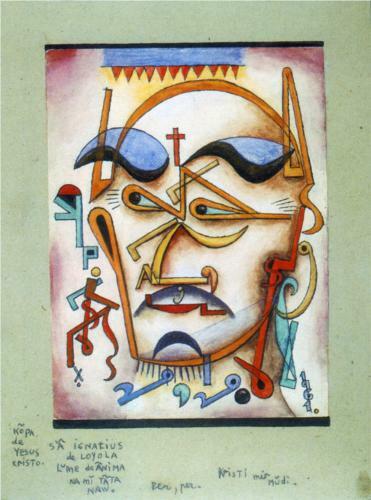 San Ignatius de Loyola by Xul Solar (Argentinian painter) 1961. While recovery from a battle injury, a cannonball to the leg, Ignatius read the Life of Christ by Ludolph of Saxony. Here he saw God as the God of Love. The book as Ignatius would have seen it is shown below. 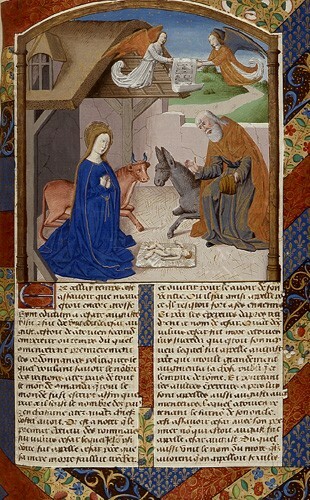 Nativity by Ludolph of Saxony from Vita Christi (Life of Christ) read by Ignatius. 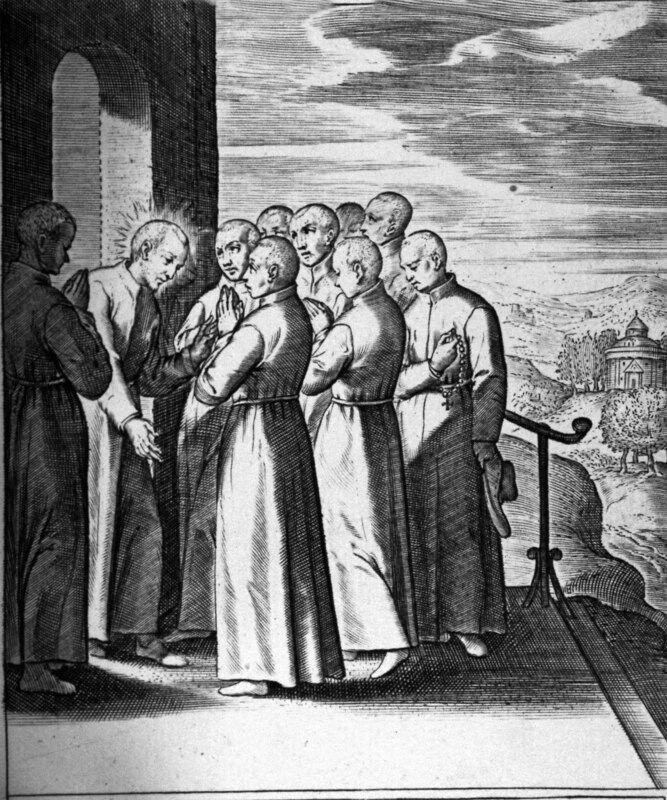 Vita Christi (Life of Christ) by Ludolph of Saxony also called Ludolph the Carthusian influenced Ignatius greatly. Ludolph proposes a method of prayer which asks the reader to visualize the events of Christ’s life. A version of this was put into the Spiritual Exercises. 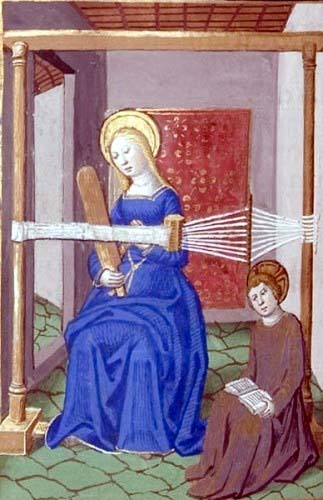 Mary weaving with Jesus by Ludolph of Saxony from the book Vita Christi (Life of Christ) which Ignatius studied. 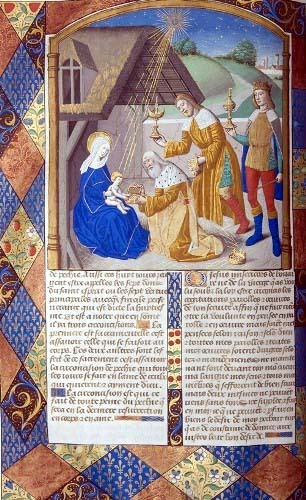 Epiphany by Ludolph of Saxony from Vita Christi (Life of Christ). you left . . .
“Stay the course and visit Me. 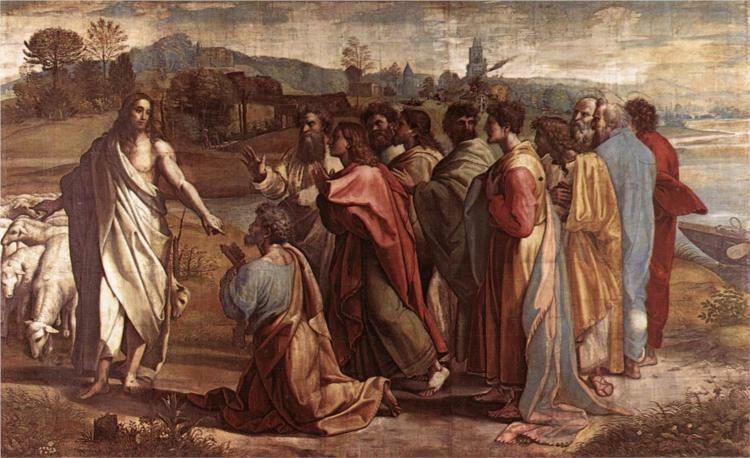 Get to know Jesus through our imagination, says Ignatius. XI. Knowing the Jesus who is Poor. The Jesuits associate being poor with humility. 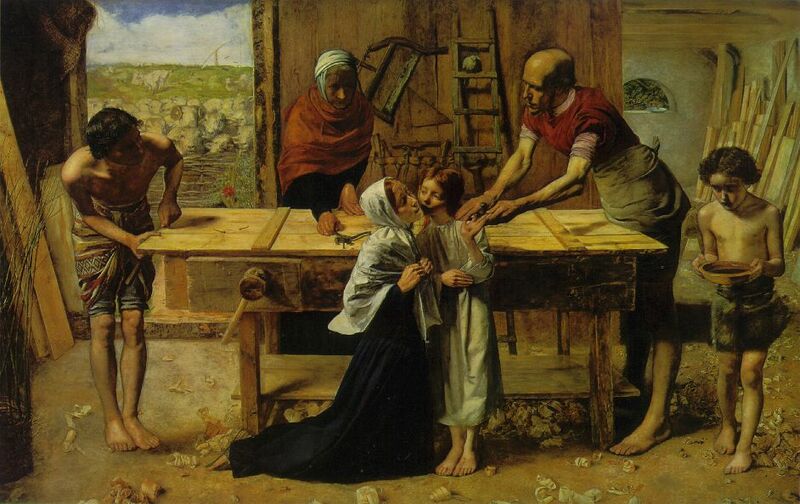 Jesus was a common carpenter, a relatively poor and humble man. 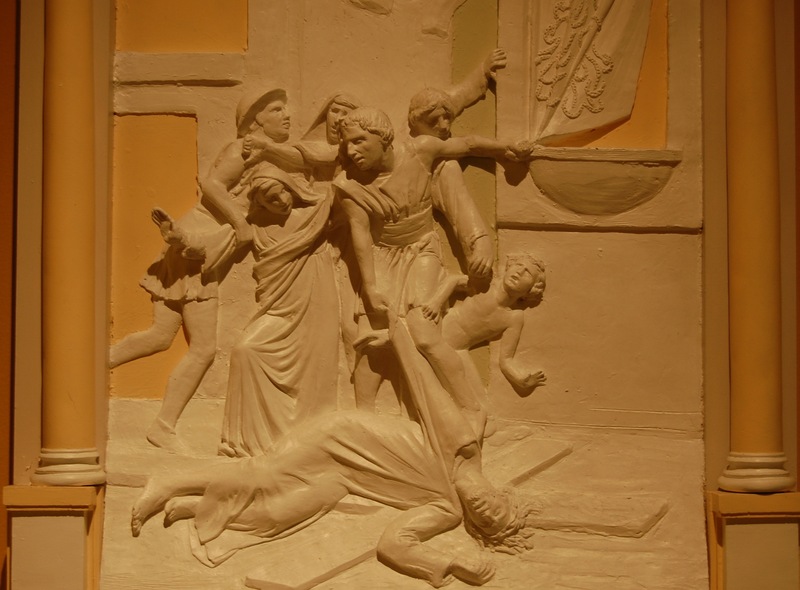 Ignatius felt we should experience the gospel stories especially those with travel and human interactions, like The Presentation seen here in life like stone figures from Our Lady of Czestochowa National Shrine. a friend to talk to. of a retirement home – road show. then a stray comment to put God first. where nothing was needed after all. Sculpture at Old St. Joesph’s Church. Jesus takes the initiative. We work alongside Jesus. Ignatius of Loyola. 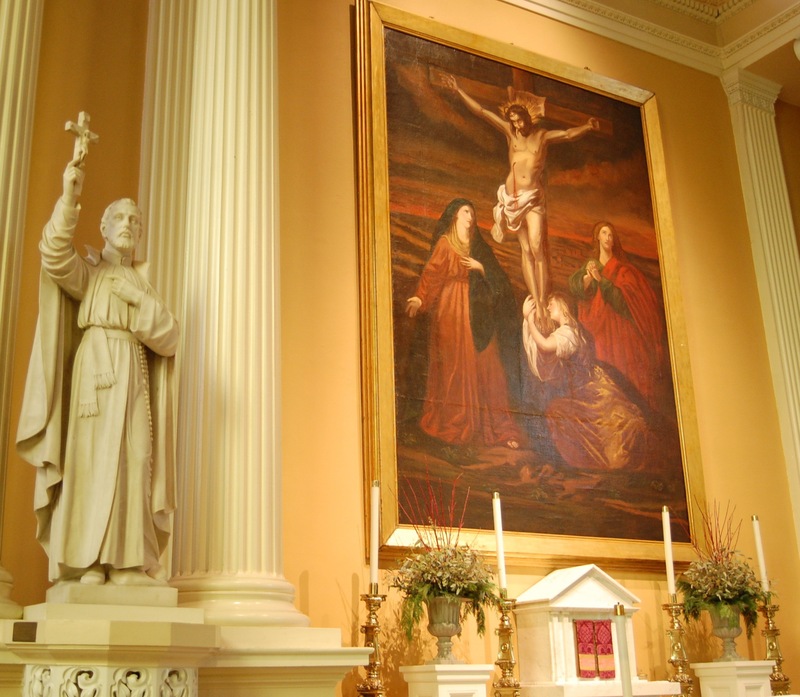 Picture resides next to Francis Xavier icon at Old St. Joseph’s Church, Philadelphia, Pennsylvania. “Everything we have received is a gift from God. We respond to his love by giving it away, by showing it in a way of serving”. – David Fleming S.J. interpretation of Ignatius Spirituality. 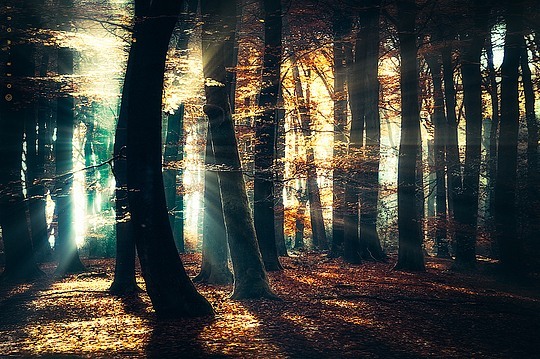 Battle of the Light by Oer Wout. David Fleming S.J. says it’s the Lucifer Flag vs the Christ Flag, although the lines are not well pronounced. Ignatius talks about good and evil and the battle ensues. Our work vision is to overcome all evil in the world. 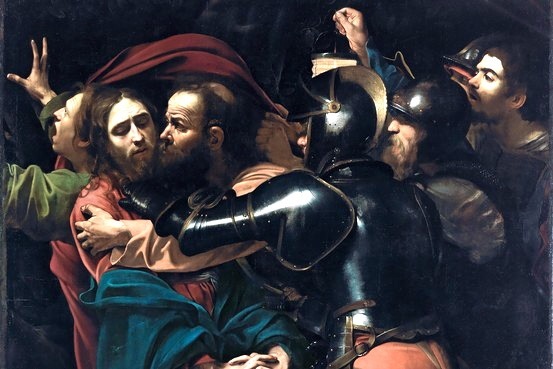 Taking of Christ by Amerighi Caravaggio 1602. You are there. 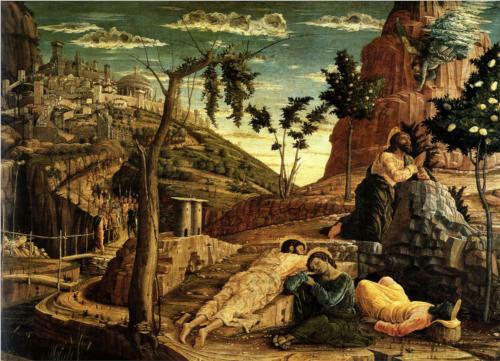 Ignatius suggests we imagine we are in the Passion of Christ. In the Taking of Christ painting, Caravaggio painted himself as a witness, in the far right side with hand raised. Ignatius asks us to place ourselves in the Gospels, as witnesses of the sacred saga. Everything is a gift from God. 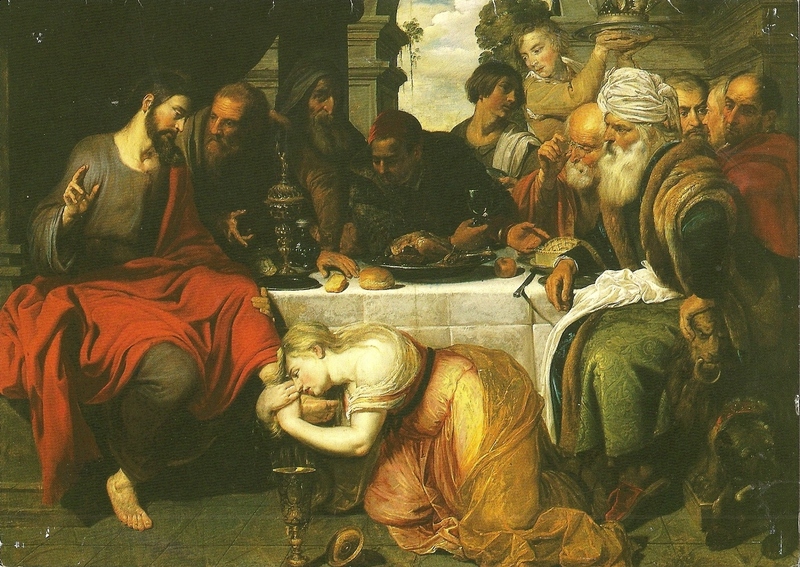 In the spiritual exercises of the third week Ignatius wants us to pray around two Gospel passages: the last supper (Matthew 26) and Christ washing the apostles’ feet (John 13), says David Fleming S.J. 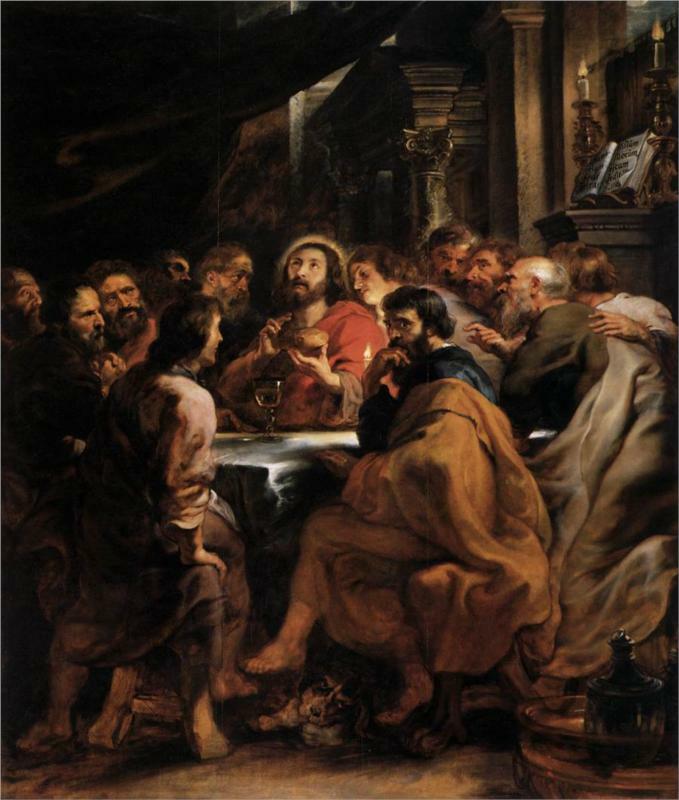 The Last Supper, when Jesus gave us his body and blood, is the greatest mark of God’s love, according to David Fleming S.J. 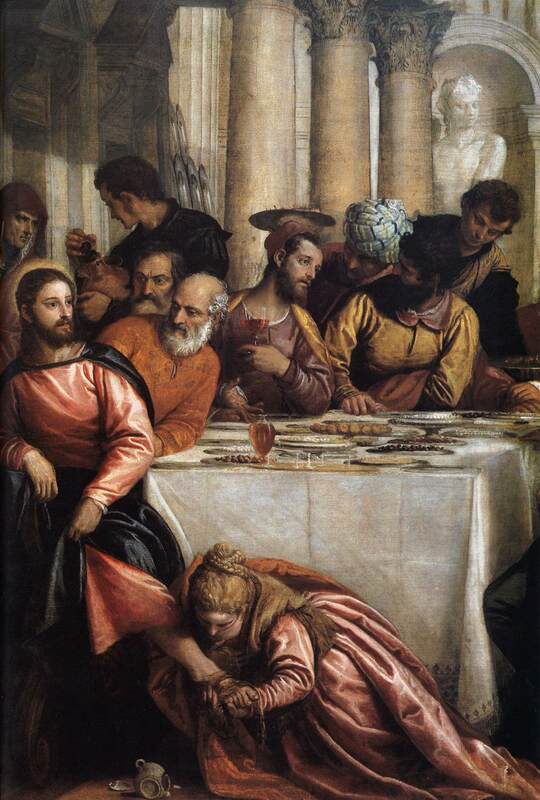 Christ washing the feet of the disciples by Palo Veronese 1580s. Jesus is willing to do whatever it takes. 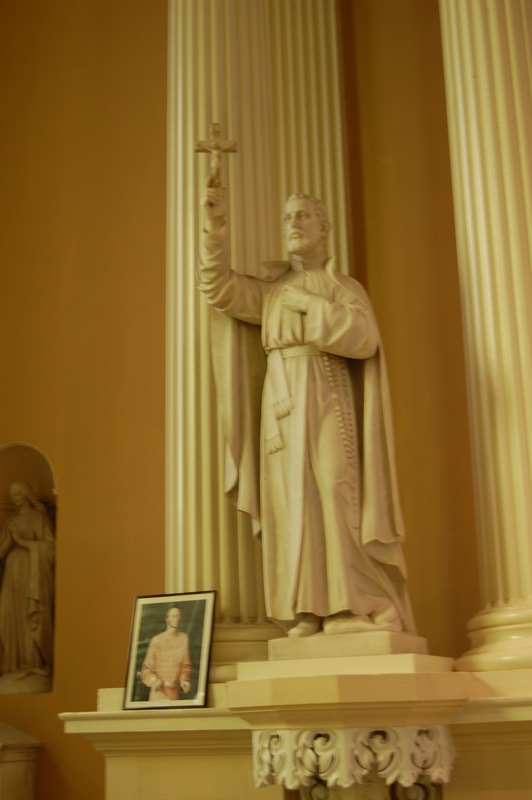 Francis Xavier and The Cross, Old St. Joseph’s Church, Philadelphia PA.
Ignatius asks us to imaginatively come into the presence of Jesus on the Cross. We are with the disciples at the foot of the cross, seeing the face of Christ and what he did in response to sin. We are to consider what Christ did in response to sin. 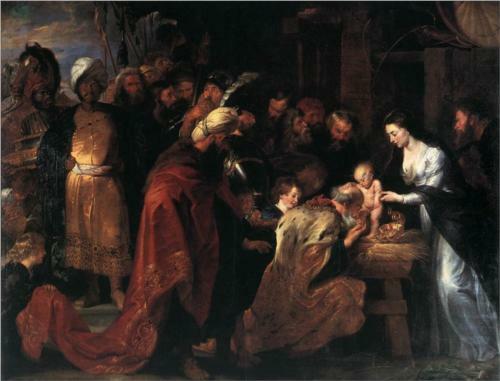 Ignatius Vision at Mass in Manresa Monastery by Peter Paul Rubens (1577 – 1640). 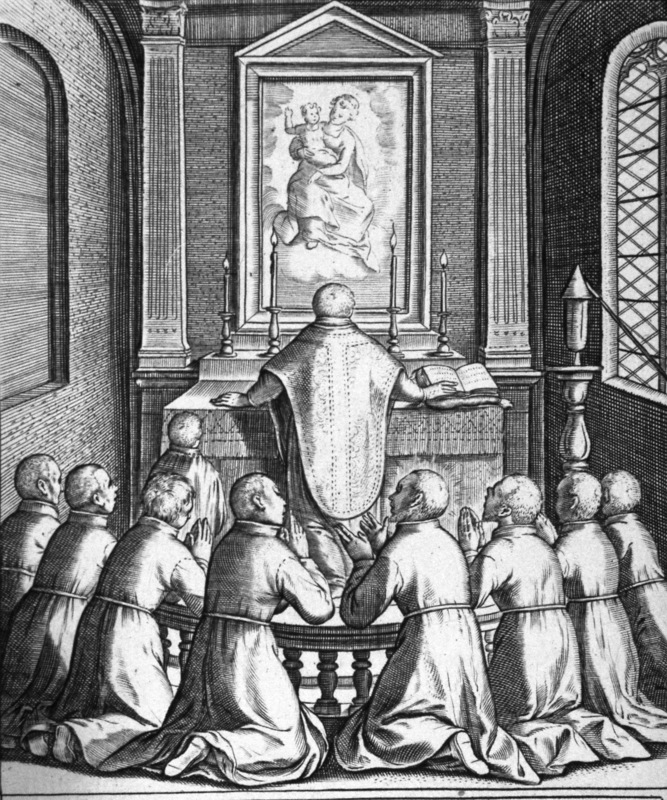 At Manresa, Ignatius has a vision of seeing Jesus at Mass. In his autobiography (recited in the 3rd person) Ignatius says, “at the elevation of the body of Christ our Lord he beheld, with the eyes of his soul, white rays descended from above … The manner in which our Lord Jesus Christ is present in the Blessed Sacrament was clearly and visibly stamped upon his mind”. 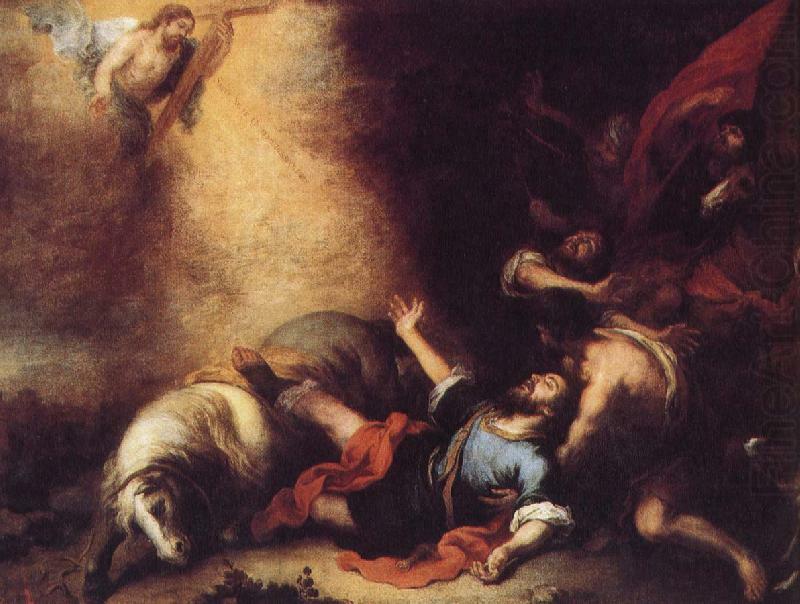 Jesus falls by Anthony Visco. 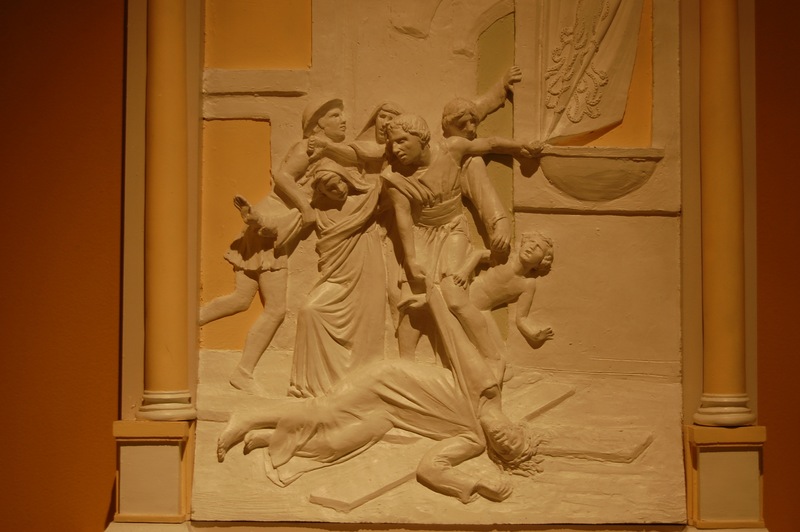 Old St. Joesph’s Church, Station of the Cross Sculpture, Philadelphia Pennsylvania. We experience the pain and agony. Before Jesus gave the disciples the Eucharist, he washed their feet. We are called to be people who serve. – David Fleming S.J. The Eucharist. Stained glass window behind altar, Old St. Joseph’s Church, Philadelphia PA. The Eucharist brings us to the most intimate possible relationship with Christ. 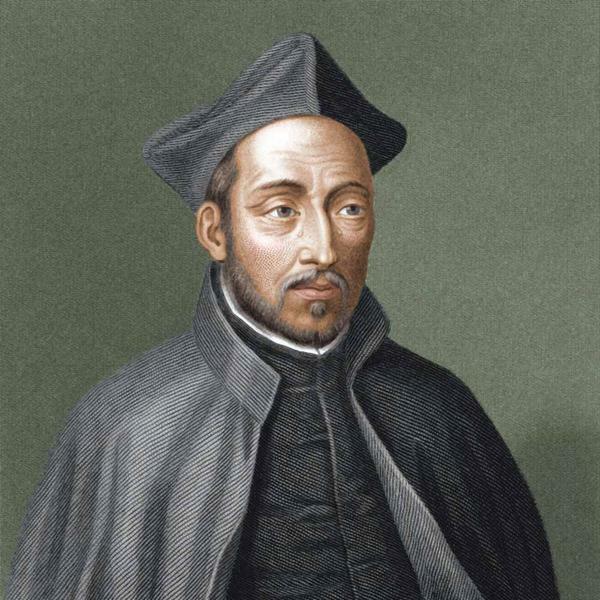 The Ignatian way is the way of the heart. The Eucharist shows God to be all heart. – David Fleming S.J. Per Ignatius, our graced response to pain is called compassion. We experience the pain and agony. Ask for the grace “to grieve, be sad and weep” over Jesus suffering. Ignatius wants us to experience it as something fresh and immediate. – David Fleming S.J. Paul’s Sanctification by Bartolome Esteban Murillo 1665. 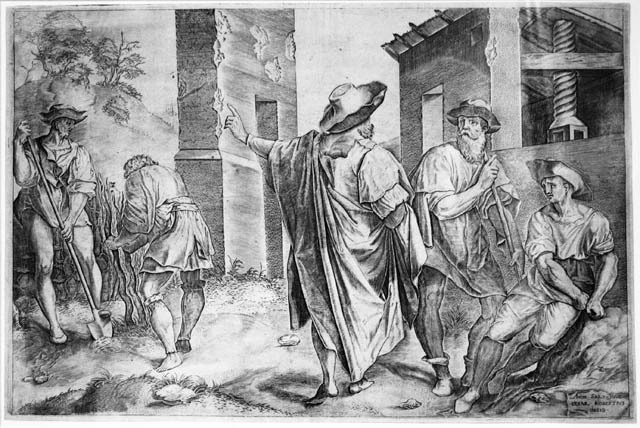 Ignatius sites two examples of “first time” decisions, or decisions guided by our heart: the Conversion of the apostle Paul and the call of the tax collector Matthew. 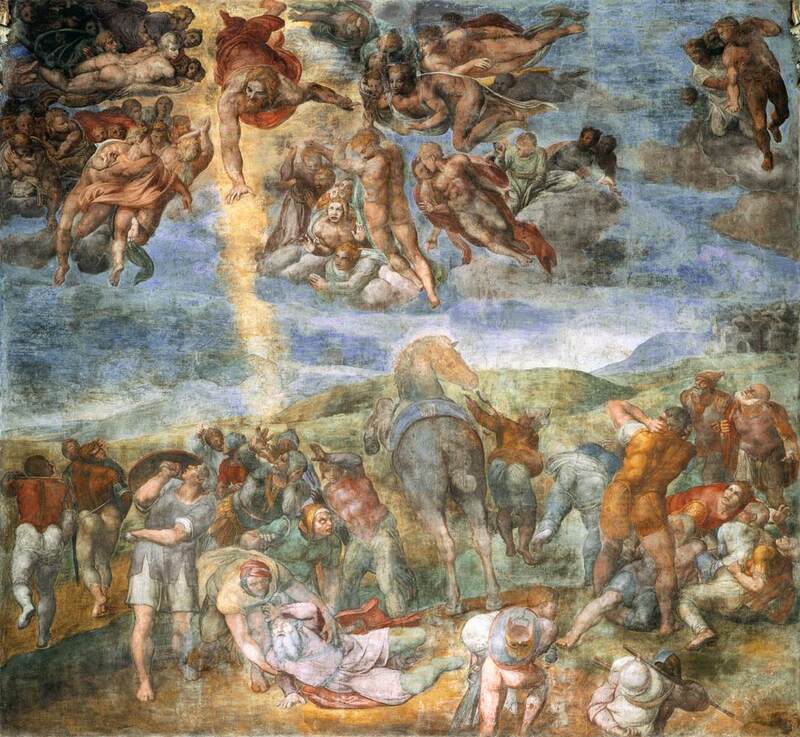 The Conversion of St. Paul by Michelangelo 1545. As Fr. David Fleming says in the little book we are using this year for our One Book One Parish program, Ignatius “underwent a profound conversion while recuperating from his wounds, but it was not a conversion of the intellect or will… His conversion involved his deepest desires and commitments, that essential center of the personality in which [the human person] stands before God. [Ignatius’] religious practice and intellectual understanding deepened over time, but it was his heart that was transformed.” – From the Pastor series by Fr. Dan Ruff, Old St. Joseph’s Church, Philadelphia PA.
Francis Xavier friend of Ignatius. Old St. Joesph’s Church, Philadelphia Pennsylvania. 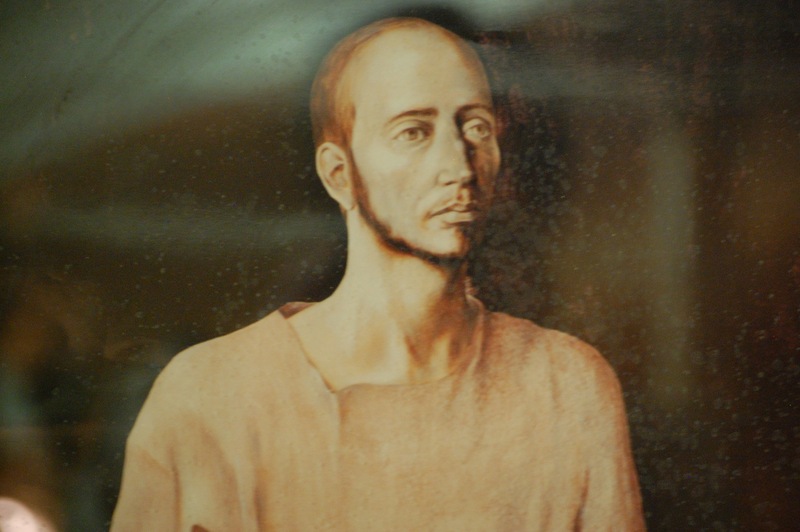 Francis Xavier is known as the Apostle of the Indies and patron saint of missionaries. He has been called the greatest missionary since St. Paul. La Storta Vision by Romersk Maleri 1611. 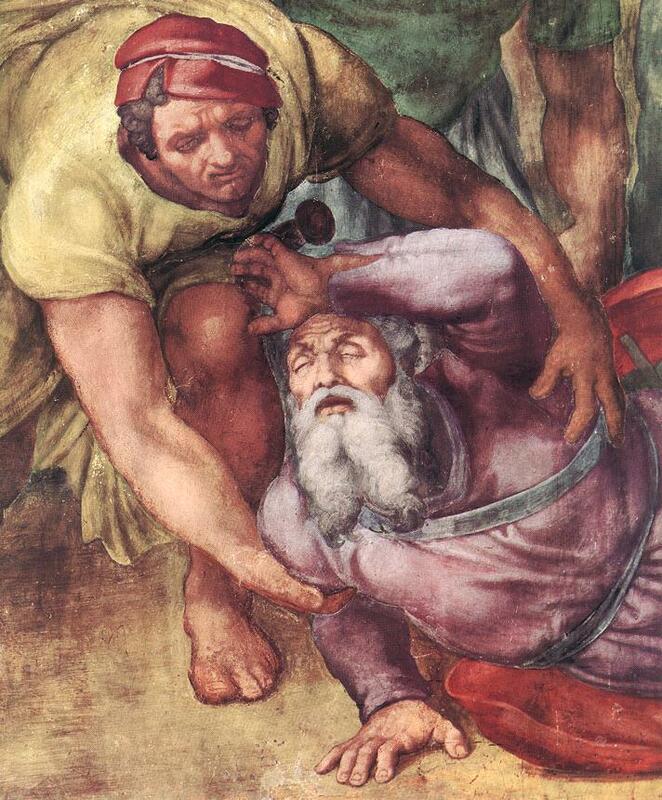 Ignatius sees God the Father and Jesus carrying a cross. “Place me with your son”, pleads Ignatius. 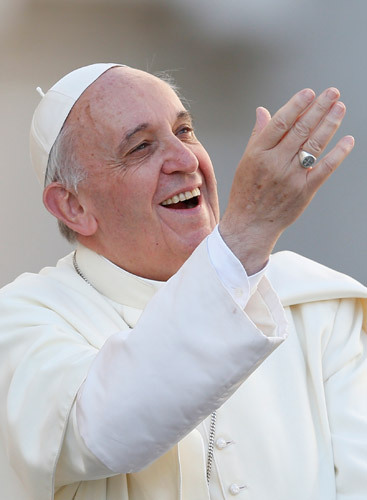 “We will be propitious (favorable) to you in Rome”, replies God the Father. Then God the Father tells Jesus, “I want you to take this man to serve us”. The Jesus says to Ignatius, “We want you to serve us”. As prophetized, when Ignatius went to Rome, the Pope approved the Society of Jesus religious order also known as the Jesuits. Parable of the Workers in the Vineyard by Cesare Roberti 1590. We are partners in Jesus in His work. 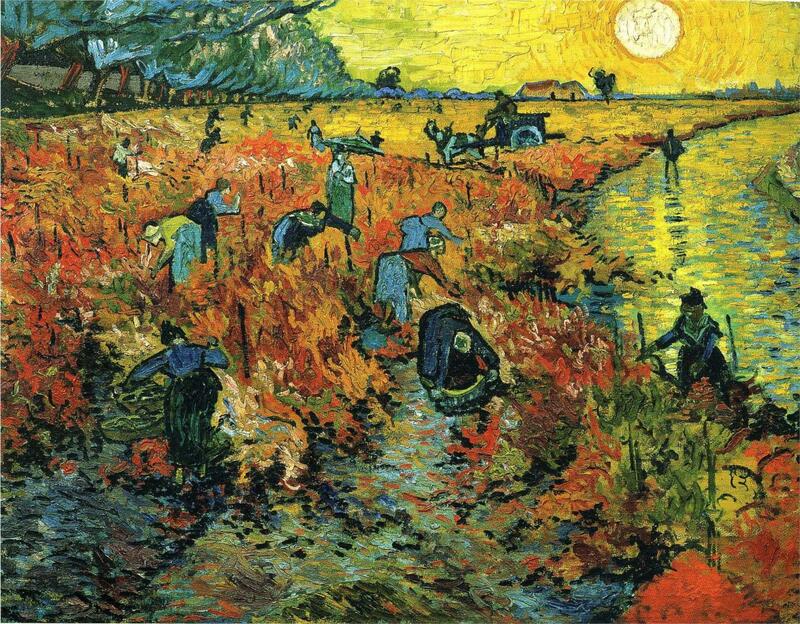 Ignatius guide to Jesuit service is the image of laborers in the vineyard (Matthew 20) where the vineyard is a symbol of God’s world. He said the work of Jesuits is to “help souls”. Jesus Carrying the Cross by Anthony Visco. Located behind the palms at Old St. Joseph’s Church, Philadelphia PA.
all that I have and call my own. You have given all to me. To you, Lord, I return it. Christ’s charge to St. Peter: Feed my Lambs by Rapael from Cistine Chapel. 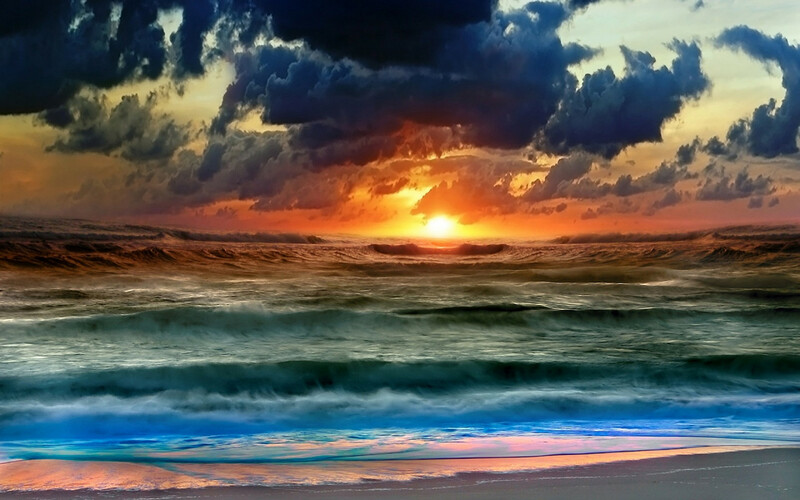 Show reverence for all the gifts of God’s creation. These gifts allow us to know God more easily, so we can return that love. We are asked to collaborate with God and care for God’s world. – David Fleming S.J. 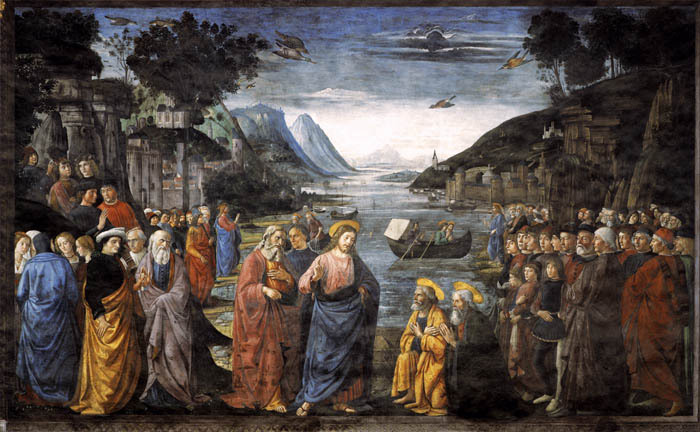 Calling of St. Peter by Domenico Ghirlandaio, Cistine Chapel 1481. 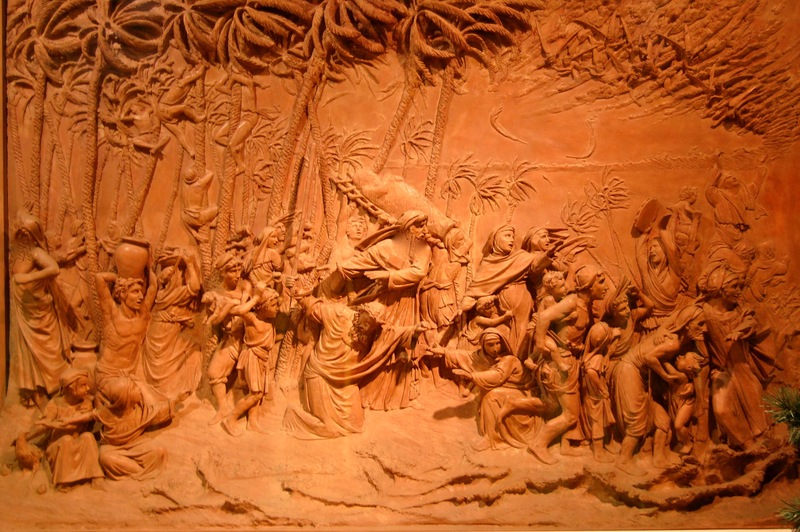 On the left are scenes from the life of Moses, and on the right scenes from the life of Christ. Also with halo is St. Andrew. 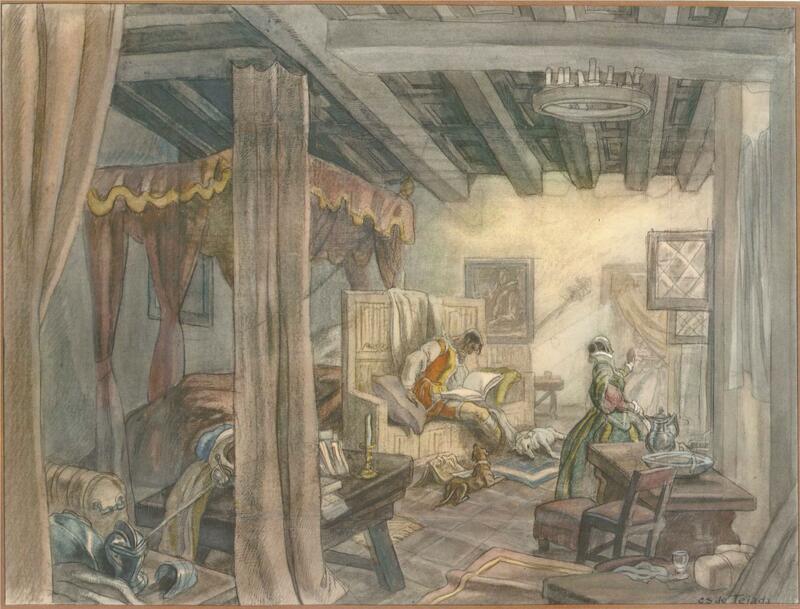 There is a good chance Ignatius saw this painting on his pilgrimage to Rome. It’s Jesus work, we just help. 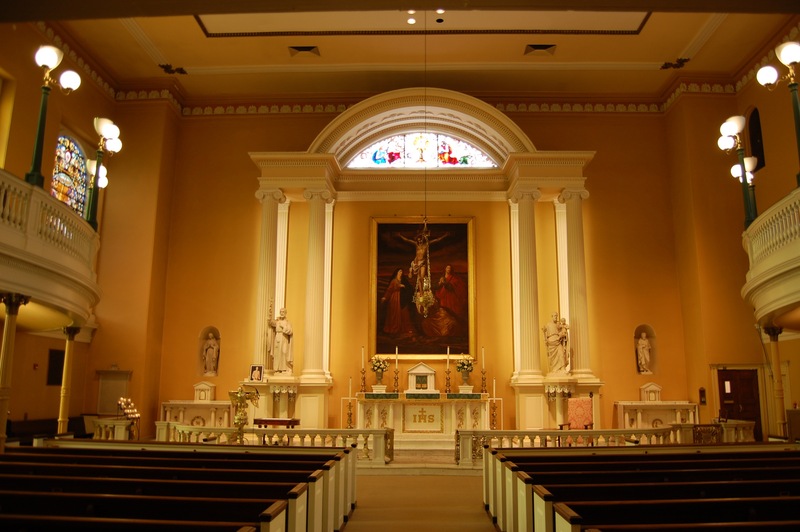 Old St. Joseph’s Church, Philadelphia Pennsylvania – Oldest Catholic Community in US. The Jesuits founded Old St. Joseph’s Church in 1733 making it the oldest Catholic Church in the nation. Yet, the storied Jesuit missionaries were forced to leave Philadelphia in 1799 due to the suppression of the Society. Philadelphia became a diocese in 1808 and the center of all clergy life was at Old St. Joseph’s. In 1833, after the restoration of the Society of Jesus by the Vatican, the resilient Jesuits took back the patronage of Old St. Joseph’s. 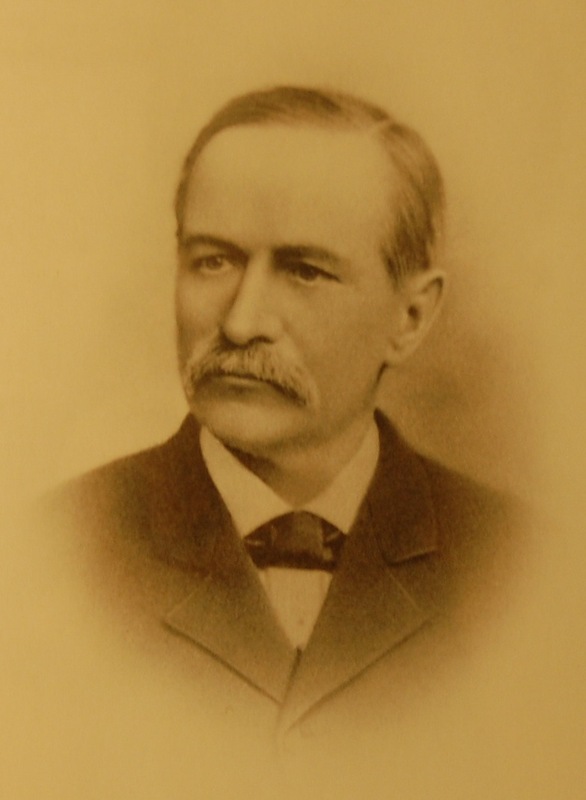 Francis A. Drexel, Patron of Old St. Joseph’s Church. Francis Drexel, the father of St. Katharine Drexel, was baptized and married at Old St. Joseph’s. He supplied funding to remodel the Church in 1886. 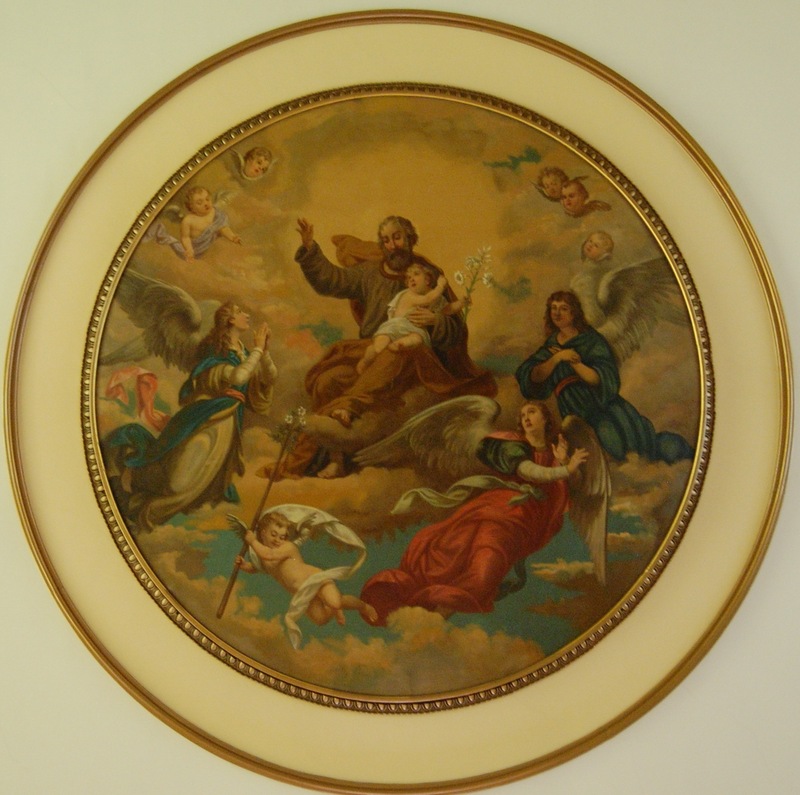 Apotheosis of St. Joseph. Nave ceiling Old St. Joseph’s, Philadelphia PA. The present Church is third church built on site. 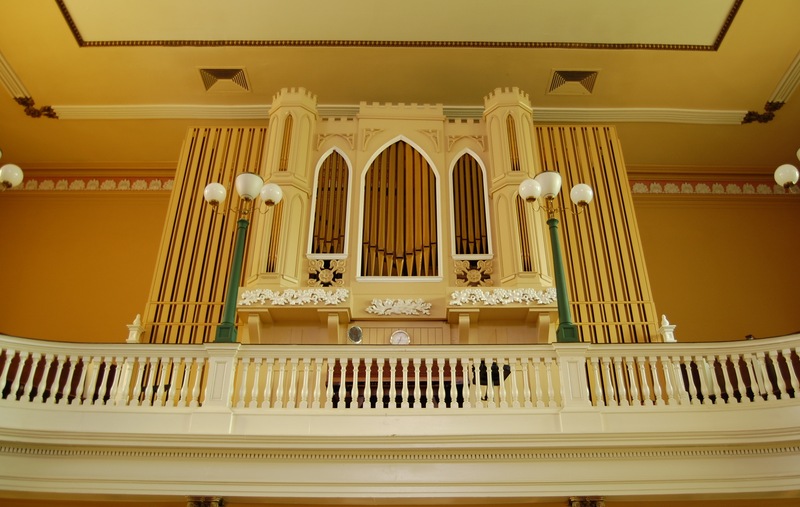 It was only church on east coast where a public Mass could be held legally from 1733 until after American revolution. “Thus at least two-thirds of the Spiritual Exercises is given over to what I call the Godspell grace – spending time in leisurely contemplation of Jesus’ life in the Gospels, seeking to see him more clearly, love him more dearly, and follow him more nearly, day by day.” – Fr. Dan Ruff S.J. From the Pastor series, Old St. Joesph’s Church. 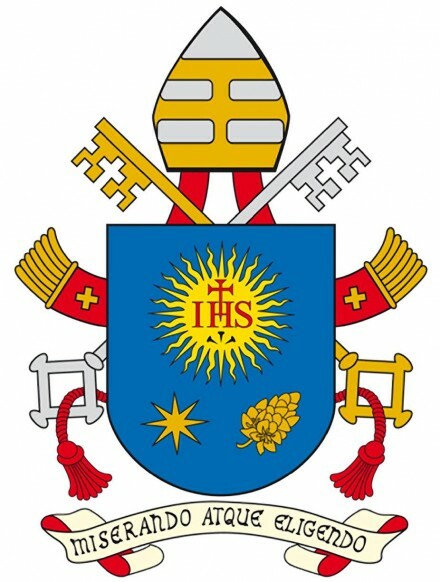 Pope Francis Coat of Arms. Much of the symbology reverts back to Ignatius. 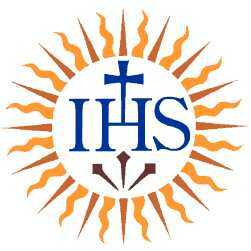 The dark blue shield includes the official seal of the Society of Jesus with the blazing yellow sun and the red letters, IHS, the sign for the name of Jesus. A red cross rises up from the letter H and three black nails rest below. The bottom part of the blue shield is an eight point gold star and a gold flower, which represents Mary and St. Joseph. The shield is surrounded a papal emblem using a gold key to represent the power in heaven and a silver key to indicate the spiritual authority of the papacy on earth united by a red cord. Pope Francis’ motto at the bottom of the COA is the Latin phrase “Miserando atque eligendo,” which means “having mercy, he called him” (from St Bede the Venerable). 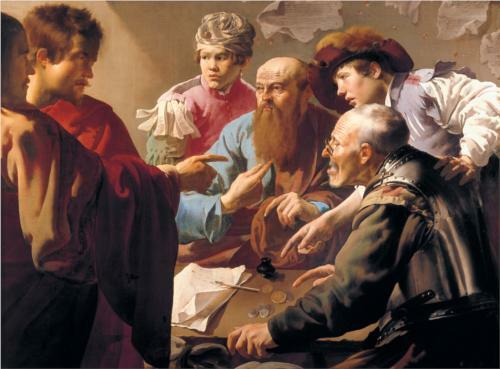 The motto is based on the Gospel account of The Call of St. Matthew, the tax collector. Credits: The Jesuit pastor at Old St. Joseph’s Church, Fr. Dan Ruff, suggested the book “What is Ignatian Spirituality?” by David L. Fleming, S.J. (Loyola Press 2008) as part of a One Book, One Parish Program for 2014. Much of this post is attributed to the Fleming book. The Old St. Joseph’s From the Pastor series were used as guides. I am a visitor at Old St. Joseph’s. 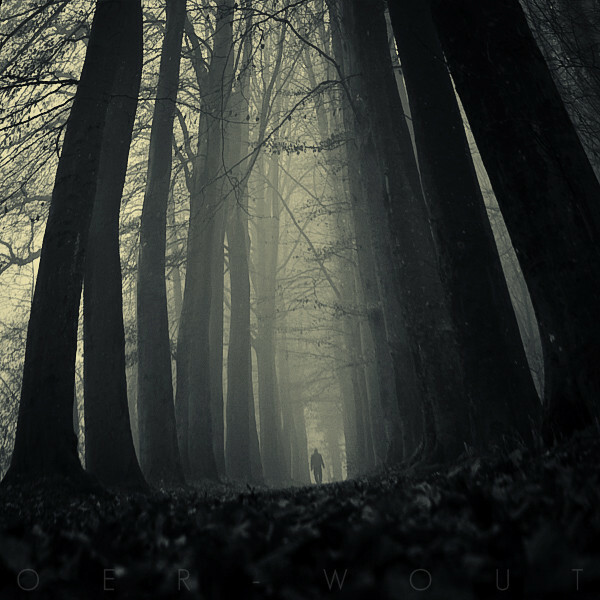 Selected photos by Oer Wout. For a FREE on-line copy of What is Ignatian Spirituality? by David Fleming S.J. go here.